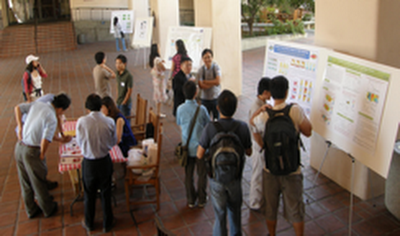 The COAA Southern California Chapter (COAA-SCC) held a Summer Workshop and Picnic on September 12, 2009 at California Institute of Technology (Caltech). Over 40 scholars and students from UCI, UCLA,JPL and Caltech attended the workshop. 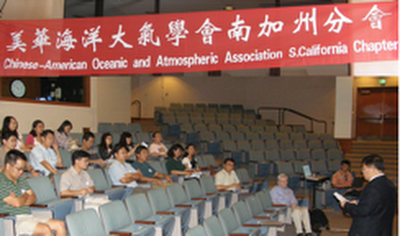 The theme of the workshop is Recent Advances in Atmospheric and Oceanic Research. There were two invited keynote speeches, four oral talks and nine posters, covering data analysis, modeling, satellite, remote sensing, instrument design, and other related topics. Professor Jin-Yi Yu, Vice Chair of COAA-SCC, from University of California, Irvine (UCI), gave the welcome remark and introduced two keynote speakers, Professor John Seinfeld from Caltech and Professor Yongkang Xue, Chair of COAA-SCC, from University of California, Los Angeles (UCLA). Professor Seinfeld shared his vision in impacts of aerosol on clouds and the mechanisms how aerosols impact clouds. Professor Xue reviewed the past and achievement of land/atmosphere interaction study, and looked forward to the future development. In four oral presentations, Dr. Yu Gu of UCLA presented her research in dust storm reduction due to precipitation and temperature enhancement in northwestern china; Dr. Xianwei Wang of UCI discussed the MODIS albedo bias at high solar zenith angles in Greenland; Dr. Sheng Wu of Caltech demonstrated current advances in Mid-InfraRed spectroscopic sensing using Quantum Cascade Lasers; and Dr. Changming Dong of UCLA showed the simulated seasonal and interannual variations in sea ice and oceanic circulation in the Bering Sea. After the oral sessions were the picnic and poster viewing. There were 9 high quality posters covering broad research topics such as direct sun measurements of NO_2 column abundances With FTUVS; tide modeling; CMAM simulations of carbon monoxide, nitrous oxide, and methane; coastal ocean data assimilation and forecasting system; groundwater modeling; locating tropopause folds with the CTM and satellite measurement; reactive oxygen species generation; and impacts of land surface processes on the south American monsoon system simulations. The participants had lively discussions while enjoying the food and viewing posters. Prof. Jin-Yi Yu was giving a welcome remark. Thank every one in COAA-SCC. It is a very professional and high quality workshop.